Photos by Jennifer Fumiko Cahill A pie of one's own. Photos by Jennifer Fumiko Cahill It's what's inside that counts. Photos by Jennifer Fumiko Cahill Put a beer-battered ring on it. How did your Thanksgiving go? Maybe a wedge of Costco's satellite-dish sized pumpkin pie satisfied your cravings, maybe it didn't. Even if all your favorites showed up on the table, you are not done with pie. 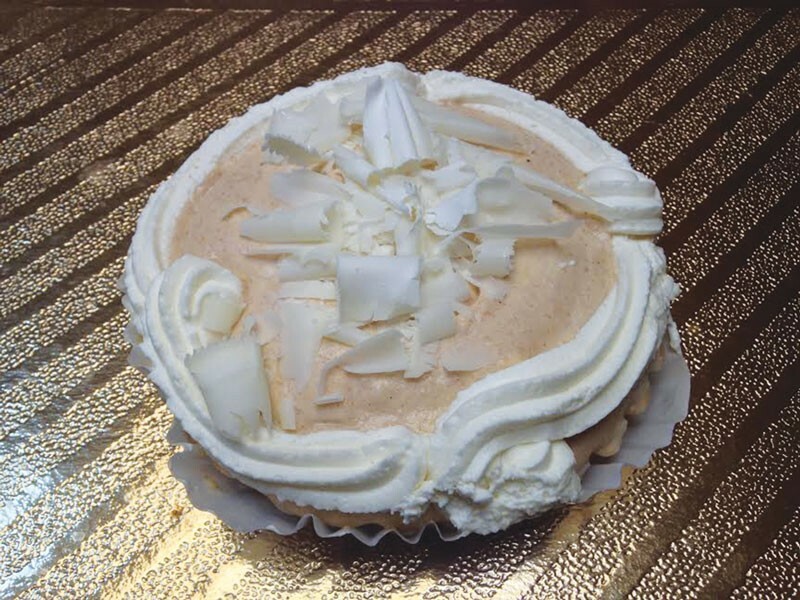 North Coast Co-op's (25 Fourth St., Eureka; 811 I St., Arcata) pumpkin cream pie is worth extending pumpkin-flavored-whatever season ($5.25). The small tart shell is painted with white chocolate (keeps it from going soggy and makes you feel genuinely cared for) and filled with a fluffy and decadent mixture of whipped cream and spiced pumpkin filling. If you have to be hit in the face with a pie, make it this one. It's like eating pumpkin pie with the amount of whipped cream you'd top it with if only you weren't being watched. And yet it's small enough to share with three friends or kill in one Netflix binge. Really depends on how Thanksgiving went. 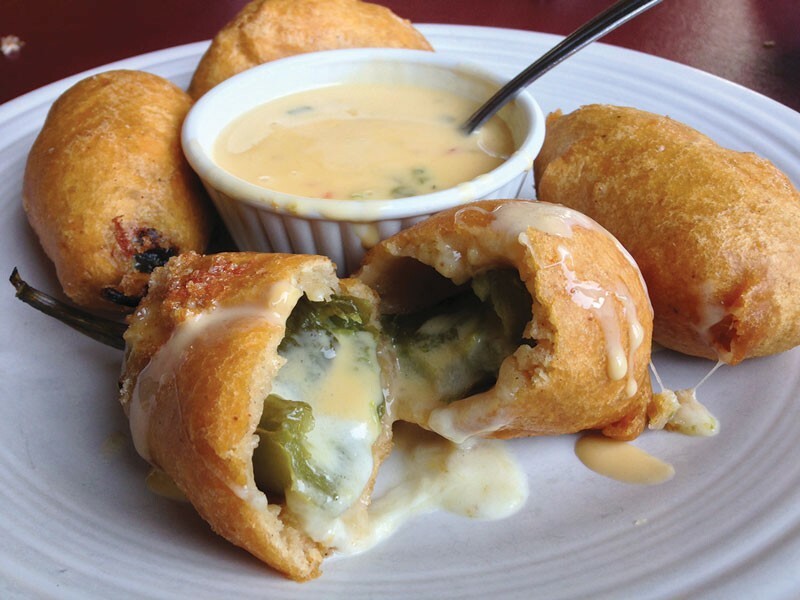 A reader emailed a hot tip that sent us to Pachanga (1802 Fifth St., Eureka) for jalapeño poppers ($9.50). Aren't they all kind of the same? Push away all those unhappy memories of TGI Friday's and its frozen and fried heartburn bullets. Pachanga's arrive four-to-a-plate and looking like stunted corn dogs. The thick cornmeal batter is savory and crunchy outside and soft and moist inside, like a quality hush puppy. Cozied within are fresh chilies, fat and deep green, roasted daily for a whiff of smoky charring while maintaining their crispness. There's a bite, of course, but it's mellowed by the roasting, and the ribs and seeds are completely removed and replaced by stretchy, white queso blanco. Be not afraid. Feel not ripped off, either, as one order of these little wonders is substantial enough to share, and the accompanying cheese sauce with peppers and tomatoes will not go to waste. There is a lot going on at Shamus T Bones (1911 Truesdale St., Eureka), what with the sparking Tesla coil, the judgmental taxidermy and the controversially boiled ribs. Take the advice of another Journal tipster and focus your attention instead on a plate of Walla Walla onion rings ($7.99). 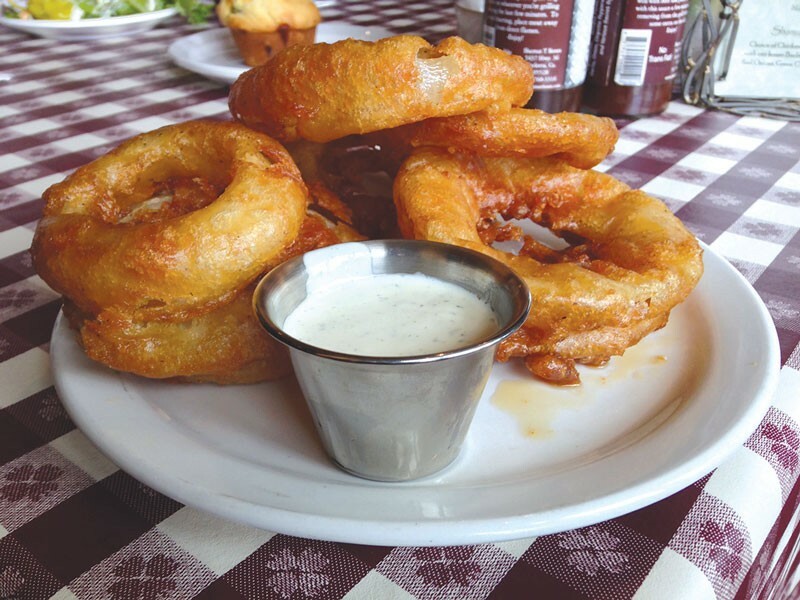 The world's most honest waiter informed us these rings, unlike the frozen ones you get as a side, are freshly beer battered and fried. The Walla Walla is one of those large, sweet onions, the flavor of which comes through since the batter has little salt. Sprinkle if you must, or better yet dip your piping hot rings in a little ranch or the house barbecue sauce. But the crust is just as it should be, brown and crunchy and plenty of it, a nice contrast to the tender onion underneath. And it's meatless, so that mounted buck can drop the pissy stare, thank you.